A selection of contents: Preface. 1. The CO2-Carbonic Acid System and Solution Chemistry. Basic concepts. Activity coefficients in solutions. Influences of temperature and pressure. The carbonic acid system in seawater. Calculation of the saturation state of seawater with respect to carbonate minerals. Concluding remarks. 2. Interactions Between Carbonate Minerals and Solutions. Sedimentary carbonate minerals. Solubility behavior of carbonates. Surface chemistry of carbonates. Carbonate dissolution and precipitation kinetics. Concluding remarks. 3. Coprecipitation Reactions and Solid Solutions of Carbonate Minerals. General concepts. Coprecipitation of Foreign'' ions in carbonate minerals. Magnesian calcite. Stable isotope chemistry. Concluding remarks. <STRONG>4. The Oceanic Carbonate System and Calcium Carbonate Accumulation in Deep Sea Sediments. </STRONG>An overview of major processes. The CO<INF>2</INF> system in oceanic waters. Sources and sedimentation of deep sea carbonates. The distribution of CaCO<INF>3</INF> in deep sea sediments and carbonate lithofacies. Factors controlling the accumulation of calcium carbonate in deep sea sediments. Variability of calcium carbonate deposition in deep sea sediments with time. Concluding remarks. <STRONG>5. Composition and Source of Shoal-Water Carbonate Sediments.</STRONG> Introduction. Shoal-water carbonates in space and time. Carbonate grains and skeletal parts. Biomineralization. Precipitation of carbonates from seawater. Concluding remarks. <STRONG>6. Early Marine Diagenesis of Shoal-Water Carbonate Sediments. </STRONG>Introduction. Some prelimanary thermodynamic and kinetic considerations. Very early diagenesis. Concluding remarks. <STRONG>7. Early Non-Marine Diagenesis of Sedimentary Carbonates. </STRONG>Introduction. Plate-tectonic controls on diagenesis. General considerations for early non-marine diagenesis. Major phase transformations. Mass Transfer during diagenesis. Lithification in the meteoric environment. Bermuda: A case study of a meteoric diagenentic environment. A brief synthesis of meteoric diagenesis. Concluding remarks. <STRONG>8. Carbonates as Sedimentary Rocks in Subsurface Processes. </STRONG>Introduction. P,T and X and carbonate mineral stability. Subsurface water chemistry. Continous processes. Examples ofModels'' for long-term diagenesis. 9. Current Carbon Cycle and Human Impact. Introduction. Modern biogeochemical cycle of carbon. Human impact on carbon fluxes. The oceanic system. Concluding remarks. 10. Sedimentary Carbonates in the Evolution of Earth's Surface Environment. Introduction. Sedimentary rock mass-age distributions. Secular trends in sedimentary rock properties. Carbon cycling modeling. Synopsis of the origin and evolution of the hydrosphere-atmosphere-sedimentary lithosphere. Concluding remarks. Epilogue. Introduction. The road traveled. The state of the art. Ever onward. Reference. Index. 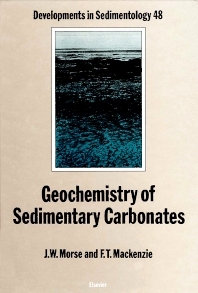 This book covers the more basic aspects of carbonate minerals and their interaction with aqueous solutions; modern marine carbonate formation and sediments; carbonate diagenesis (early marine, meteoric and burial); the global cycle of carbon and human intervention; and the role of sedimentary carbonates as indicators of stability and changes in the Earth's surface environment. The selected subjects are presented with sufficient background information to enable the non-specialist to understand the basic chemistry involved. Tested on classes taught by the authors, and approved by the students, this comprehensive volume will prove itself to be a valuable reference source to students, researchers and professionals in the fields of oceanography, geochemistry, petrology, environmental science and petroleum geology.